Dorking back to winning ways! 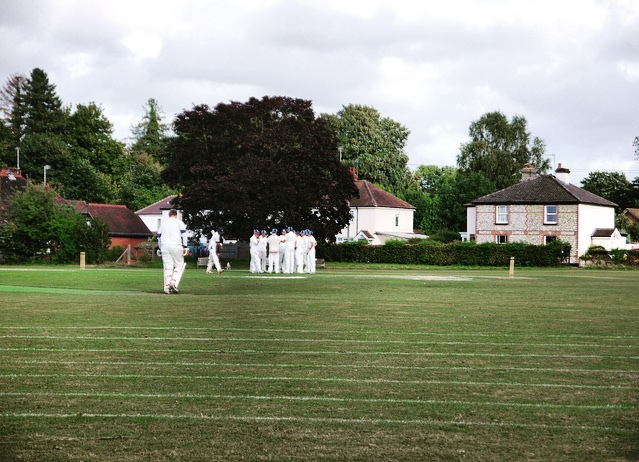 On Saturday 2nd June, Dorking entertained Sanderstead in the Travel Bag Surrey Championship. This was the first in the time game format and skipper Toby Blood won the toss and inserted the opposition. The away side began steadily and were relatively unscathed in the first 6 overs with Shareef Hassan and Tyler Ward looking secure at the crease. That was soon to change! Danny Douthwaite picked up his first wicket with a superb caught and bowled attempt that dismissed the dangerous Hassan. This wicket was soon followed with 3 quick ones. The next to fall was Ward nicking to Erasmus at slip and soon the score was 30-4. Jackson being cleaned up first ball and Fish seeing his off pole fly. Dorking were on fire and Corbett took a wicket himself with Erasmus taking a screamer at slip one handed! Sanderstead dug in for 8 overs, but with the tight bowling from the home side, they struggled to wrestle back any momentum. It was soon 66-8 at drinks with Danny picking up his 7th wicket. Douthwaite had bowled 14 overs, 7-25 from his permitted 14 overs. A superb return! Too often Dorking struggle to kill games off but this was not the case here. Leg spinner Myers mopping up the tail with 2 quick. 73 all out, a ruthless performance from Dorking. As well as the bowling, special mention to the intensity and attitude in the field. Catching was clinical and Chris Ward was electric in the field. In réponse, Erasmus fresh off his ton struck three boundaries in the first over, to reduce the target considerably within the first 6 balls. Credit to Sanderstead who charged in and didn't give the game up easily. Dorking were 2 down with Lister and Rogers both seeing their stumps in tatters. Douthwaite and Erasmus settled any nerves however, with both batsman hitting regular boundaries to ease any pressure that was there. Dan struck his first scoring shot soaring over the pavilion and Brad was quickly onto anything slightly full of length. The game ended fittingly with a Douthwaite 6 into the box hill end edge! A brilliant 24 points that leaves the team in 3rd place.